Yarn and Fiber Happenings: New Silk and Wool Yarns and New Hand-Dyed Fibers in Great Colors! 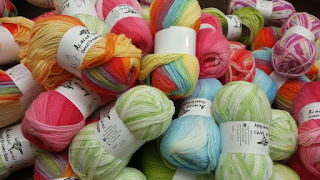 New Silk and Wool Yarns and New Hand-Dyed Fibers in Great Colors! New Limited Edition Ivy Brambles Silk and Wool Worsted has arrived! We have a limited amount of this beautiful yarn that is hand-dyed exclusively for us by Ivy Brambles! Each skein has 185 yards per 100 gram (3.5 oz) skein of beautiful 50% Mulberry Silk, 50% Merino Wool and gorgeous colors! Great yarn for your next great project! Also, newly arrived, lots and lots of newly dyed Alpaca roving, Polworth and Cormo wool for spinning or fiber blending. Amazing colors available in 4 oz hanks as well as 1 oz bags. Great fiber, great colors, great prices.